Hello all, Larry Lohrman from PhotographyForRealEstate.net here. I like to explain how professional quality real estate photography works for everyone involved in real estate. Nowadays essentially all home buyers use the Internet themselves to search for a home in the neighborhood, price range, with the number of bedrooms, square feet etc., they want. They pare all the possibilities down to a list that’s short enough to physically go look at, take that list to their agent and tell them, “We want to go see these homes.” When searching online for a home a buyer may have to go through hundreds of possibilities. Online home searches, give you list of short descriptions with a thumbnail photo of the front of the home. In this search process the small thumbnail photo is the first thing that entices the home searcher to click on a link to see more photos and more information. So that little thumbnail of the front exterior of the property becomes super important. It’s the lure that gets the home searcher to look more at this property. And if they look at the listing the additional photos can either represent the property well or not. The listing photos play a big part in helping the buyer quickly and efficiently find the property they want. Multiple studies have shown that homes marketed with professional photography get more showings and therefore the property sells for more. The most significant study is the 2010 Redfin study (See: http://blog.redfin.com/blog/2010/09/a_picture_is_worth_a_thousand_dollars_true_or_false.html#.UfiHjD5gZnA) that indicates that a home sells for anywhere from $900 to $116,000 USD more when professional quality marketing photos. 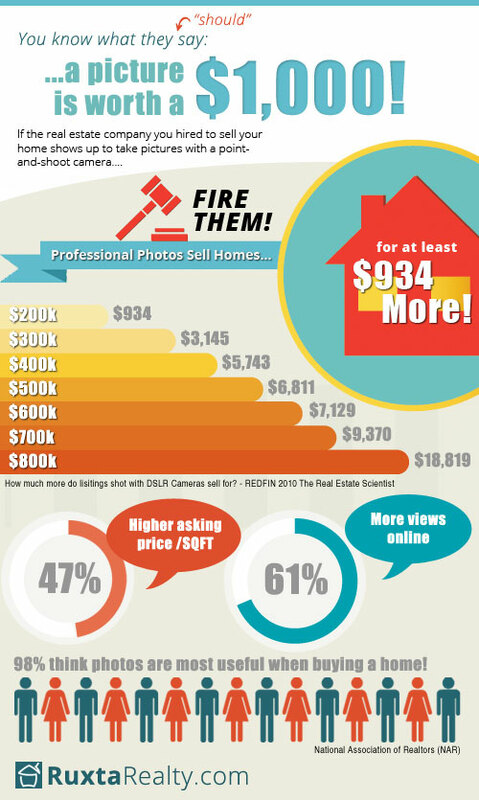 The info-graphic below was created by Robert Preville, a Wilmington, NC Realtor (www.ruxtarealty.com) from the data from the Redfin study, it illustrates the importance of good marketing photography in selling a home. The home seller client will be pleased how you are presenting their property and will be getting more for their property because of it. It’s a well-established fact that great photos and marketing materials are a way to get more listings. Neighbors of the listing property watch carefully how a property is marketed. If they like what they see, they will ask the agent to list their property when the time comes to sell. If there is competition for a listing between agents, the commitment of professionally done photography and marketing materials can help the agent win the listing contract. The listing agent is the marketing expert in charge of selling a client’s property and it is important they understand the way marketing photos work so they can use photography to the maximum benefit whether they shoot their own photos or hire a professional photographer. For anyone that wants more detailed information on this subject, click here (http://lohrman.com/blogimage/REPhotoGuide4.3.pdf ) to download a free 9 page ebook that goes into more detail on what everyone needs to know about real estate photography.